It doesn’t matter who you support, England or Australia, it’s a safe bet that supporters from both sides will agree the standard of umpiring this 2009 Ashes series has been nothing short of abysmal. Rudi Koertzen and Billy Doctrove have been the main offenders. Throw in a shocker or two from the enigmatic and inconsistent Billy Bowden, and you’re left with a much anticipated Ashes battle, spoilt by officialdom. Andrew Strauss’ catch at slip to dismiss Phillip Hughes in the second Test is one of the more obvious ones. It’s fair to say with regards to this catch that the ball and turf were in very close proximity to each other. Yet Strauss, perhaps a little surprisingly to some, was confident enough to raise the ball and claim the catch without any doubt. Strauss’ word was enough for Koertzen on this occasion, and therefore the decision was not referred upstairs to Nigel Llong, the 3rd umpire, and consequently Hughes was on his way. Just one day earlier however, Koertzen and Doctrove thought it was necessary to send Nathan Hauritz’s catch to dismiss Ravi Bopra upstairs for further viewing, where the video evidence proved to be inconclusive enough to call out, therefore, rightly giving Bopra the benefit of the doubt and allowing him to continue his innings. Both catches were dubious, yet one was referred to the third, and one wasn’t. Flintoff claiming Katich to a no ball in the 2nd Innings of the 2nd Test is another, and there are many more examples like the ones just mentioned throughout the series so far, some in favour of the Australians as well. But for the sake of getting on with it, let’s leave the examples here. So why then must the players, and just as importantly the spectators put up with this frustrating standard of umpiring, in such a high profile and popular tournament on the Test Match calendar. I’ll tell you why. 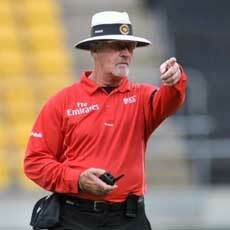 Because the ICC will not allow the best, and ‘in form’ umpires to stand in Test matches involving their own countries. So, in effect, the ICC are prepared to pass on the opportunity to have the best umpires officiating, in the best tournaments, because they obviously believe that patriotism is a stronger emotion than honesty with their staff. Which, not only shows a complete lack of respect, but also a complete lack of faith in the men they entrust to umpire Test Match Cricket. Sure, it should do away with the majority of bad umpiring calls, and therefore make the game fairer for all teams, although I’m not alone in having some serious doubts on Hawkeye’s accuracy at times, particularly with LBW calls. But this aside, is it possible the referral system process, or put more bluntly, the delays in the Test Match which are imminent, detract from the spectacle of the game. And, can Test Cricket, which has for years now been on the endangered species list, seriously survive as a spectator sport, if the administrators of the game put systems in place to slow the game down even further. With Twenty20 cricket growing in popularity each year, Test Cricket needs to be on it’s best behavior if it’s to not only tread water, but grow and attract new fans to the game. Slowing Test Cricket down in order to rid the game of umpiring errors is, I think, a very dangerous practice. But, if the ICC were to allocate the best, and in form umpires to the best and higher profile Test Match tournaments, like the Ashes, regardless of where the umpires hail from. This would be a far more practical plan-A. Besides, if the ICC continues to treat their Test Cricket umpires like untrustworthy droids, before long there won’t be any umpires coming through the system, and the greatest form of the game will surely die. Personally, I like a little bit of the human element in the game. As long as it’s just a little bit, and there’s genuine control and consistency in the umpiring. And wouldn’t it have been fantastic to see the two best umpires, being Simon Taufel, who has been named the leading umpire among the elite panel for each of the last five years. And Mark Benson, who joined the elite panel in 2006, and was placed on the shortlist with Taufel in 2007 and 2008, take the reigns for this Ashes series in England. But Taufel is Australian, and Benson is English. So this wouldn’t do. Sure, there might have been the odd ‘human’ moment with Taufel and Benson out there. But I’d bet London to a brick if they were out there, we’d all be talking about the spectacle in the middle, and not the umpiring.